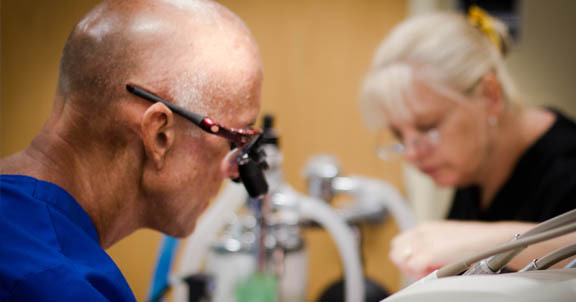 Orlando Veterinary Dentistry & Oral Surgery for dogs and cats cures and treats severe oral conditions where growths or fractures threaten comfort, function and in some cases the life of the pet. 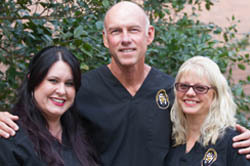 Dr. Beckman is Board Certified in Veterinary Dentistry and the only veterinarian in Orlando and the State of Florida certified as a specialist to treat these conditions. 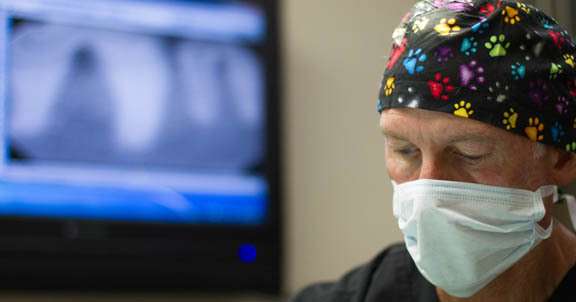 Dr. Beckman performs all advanced oral surgery procedures including cleft palate repair, jaw fracture repair and oral cancer removal. What used to be called an epulis has now been reclassified as a Peripheral Odontogenic Fibroma. 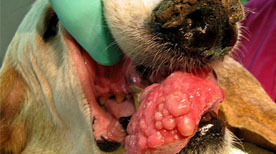 Buddy has such a tumor as shown here. 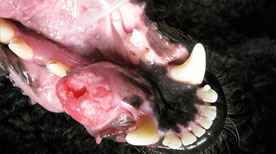 Cats can get euplides which arise from the ligament surrounding the tooth that holds the tooth in the socket. 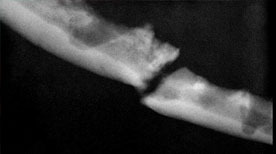 Blue Moon is a standard poodle dog with a large tumor in the jaw. 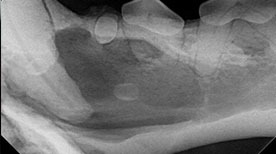 This basset hound dog has oral lymphoma that has killed a portion of bone in the right upper jaw and left the gum tissue severely inflamed. 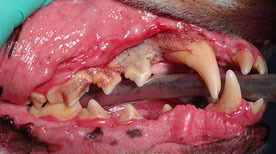 Periodontal disease in dogs can cause severe loss of bone around teeth, so much so that the jaw can fracture with minimal pressure. 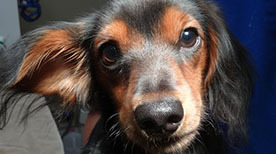 This is Boris at recheck following removal of two large cysts in each of his lower jaws. 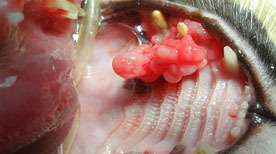 It is important to not that he is a six year old boxer dog and these cysts start forming at 6 months of age. 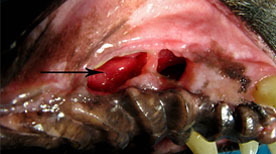 The arrow points to a hole in the palate in this dog caused by improper closure of the gum over the teeth sockets after extraction. This is called an oronasal fistula or ONF.